Comfort food and live music at Houston's GreenStreet retail and entertainment center. 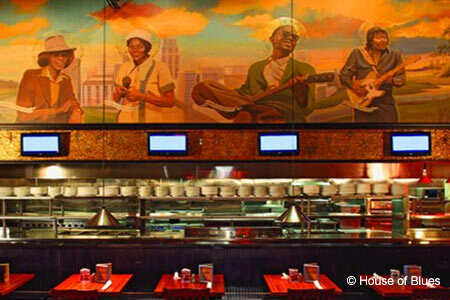 : Food and music are the focus at House of Blues Restaurant & Bar, located in Houston's GreenStreet retail and entertainment center. Nighttime acts range from rock and jazz to blues and burlesque. The comfort food menu includes dishes like jambalaya and shrimp and grits, and meatloaf and lobster mac 'n' cheese. Desserts feature unique touches, such as the white chocolate banana bread pudding finished with a bourbon-caramel sauce. Every month, the venue holds its famous Sunday gospel brunch, featuring classic Southern gospel music and all-you-can-eat Southern fare.